The Lotus-rivaling sportscar that's set to relaunch Alfa Romeo in North America will be on the road sometime in the new year. Yesterday we reported on extensive product expansion plans under way at Alfa Romeo. There&apos;ll be sedans, hatchbacks, wagons and crossovers, but the most exciting of them all will undoubtedly be the 4C. 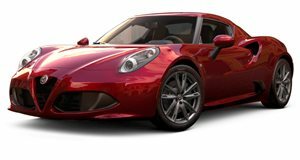 Unveiled as a concept at the 2011 Geneva Motor Show in matte red, the 4C concept returned to Frankfurt with a liquid-metal finish, making a final appearance at the Concorso d&apos;Eleganza Villa d&apos;Este in metallic red. Now Alfa has confirmed that the mid-engined sportscar will be ready for production before 2013 is out. The Alfa 4C calls for a new, high-output 1.75-liter turbo four with about 230 horsepower, driving the rear wheels through a dual-clutch transmission and mounted in the middle of a carbon monocoque chassis. A roadster variant is also planned, as is a Maserati version with V6 or even V8 turbo power. Earlier reports forecasted that the production 4C would be unveiled at the Geneva show - two years after its conceptual debut - and the smart money&apos;s still on Alfa making good on that prospect. The teaser image states that "The Alfa Romeo Prophecy of 2013 Won&apos;t Disappoint", foreshadowing "the car to end all cars".